The D Series provides WiFi enabled smart heating for stylish interior spaces, offering a controllable and energy-efficienct heating system with a sleek aesthetic. Using the Rointe Connect app on a compatible smart device, you can keep an eye on your energy use, amend your heating schedule, and turn your radiators on and off with ease. This 1210w version is ideal for spacious rooms, such as bedrooms or living areas. Download the manual for the Rointe D Series here. View the list of available custom colours for the Delta D Series here. Installing the Rointe D Series is a straightforward process that requires very little previous DIY experience. All necessary fixtures and fittings are included with the D Series to help you get started. Use the template and the screws provided to mount the brackets to the wall, and then mount the radiator onto the brackets. The D Series can then be plugged into the nearest 13A socket. All Rointe D Series Radiators come with a 3 Year Manufacturer’s Warranty on the electronic components and a 20 Year Warranty on the radiator body. This item is available with free delivery. Please allow 3 – 4 working days for the item to arrive. Rointe D Series radiators revolutionise home heating with their elegant aesthetic and uniquely innovative features. Enhanced Wi-Fi controls allow the D Series to be controlled from any compatible mobile device, providing total heat management from any location. The larger heated area provided by the 1210w D Series makes it a superb heating solution for larger areas of your home. The D Series uses thermal fluid elements designed to retain heat, which means less power is drawn to maintain comfort temperatures. Their curved design with frontal dissipation blades assists natural air circulation and ensures that rooms are kept at a uniform temperature from floor to ceiling. Each individual panel of the D Series has a 110w output, which allows it to have a much lower surface temperature compared to many other heating methods. This makes it particularly advantageous for environments where children or the elderly may be in close proximity to the heater. Using advanced heating technologies, the D Series is able to maintain temperatures within ±0.25 °C and includes a unique fuzzy logic control feature which works to prevent extreme temperature fluctuations. Where standard heaters create heat spikes and sudden lows as they turn on and off, Rointe’s fuzzy logic system modulates heat output in a way that will ensure even and comfortable heating, as well as economical energy usage. All Rointe heaters come with an Open Window Detection function which will switch the heater to Anti-Frost mode once it senses a temperature drop of 4 °C within a 30-minute period. This energy-saving feature prevents your heaters from wasting electricity by trying to heat a rapidly cooling room in the event that a window is left open by accident. The technological capabilities of the Rointe Delta Series make it the perfect heater for anyone seeking a high level of control over their heating system and energy usage. These state-of-the-art radiators feature a tactile control panel which provides advanced control via a 1.77” TFT screen and easy-to-use visual menu. You can either use the control panel to create a bespoke 24/7 heating schedule around your lifestyle, or you can take advantage of the D Series’ in-built Wi-Fi functionality and programme your heating using the Rointe Connect app. Using the app, Rointe D Series electric radiators can be controlled through the internet via your smartphone or tablet, so you can make changes to your heating system even if you’re on the move. Access to consumption statistics through the Rointe Connect app is another key feature of the D Series, providing you with the ability to view information on energy consumption and running costs. This feature allows you to optimise your heating and monitor energy usage habits on a daily, weekly, monthly and even yearly basis. 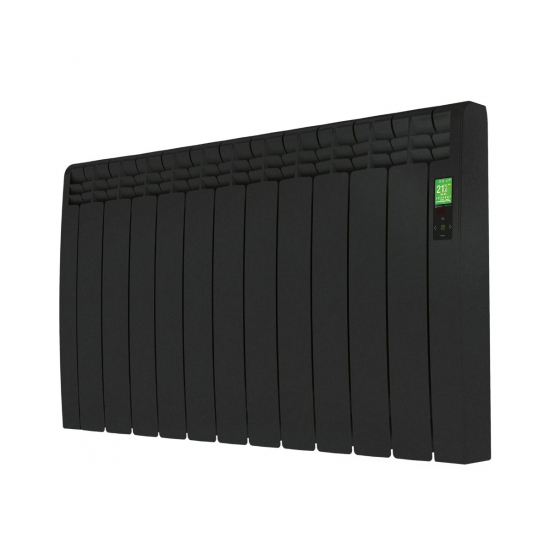 The D Series is one of the few radiators on the market that doesn’t require additional gateways or intermediate terminals to connect via the Internet – Wi-Fi capability is integrated into every unit. This version of the Rointe D Series is available in a subtle graphite grey and comes in the following outputs: 330w, 550w, 770w, 990w, 1210w, 1430w, 1600w. We also offer the D Series in white for an understated but equally sophisticated finish. Each D Series radiator comes with a 3 Year Manufacturer’s Warranty on the electronic components and a generous 20 Year Warranty on the heater body. Installing a Rointe D Series radiator is a very straightforward process which requires a limited amount of DIY knowledge. All fixtures and fittings are included so you can install your D Series in minutes. Along with wall mounting brackets, a template is also supplied to help you mark where to drill the screws into the wall. Rointe Delta D Series electric radiators are available on request in 28 RAL colours with 12 different finishes to create a custom look for your home or business. Please call our Sales team directly for a bespoke quote. Customised Rointe radiators have a 4 – 6 week lead time and are non-refundable unless damaged.